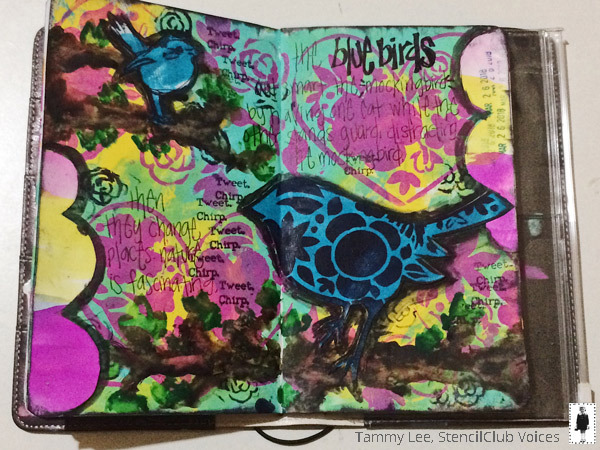 StencilGirl Talk: StencilClub Voices Make the Birds Sing! 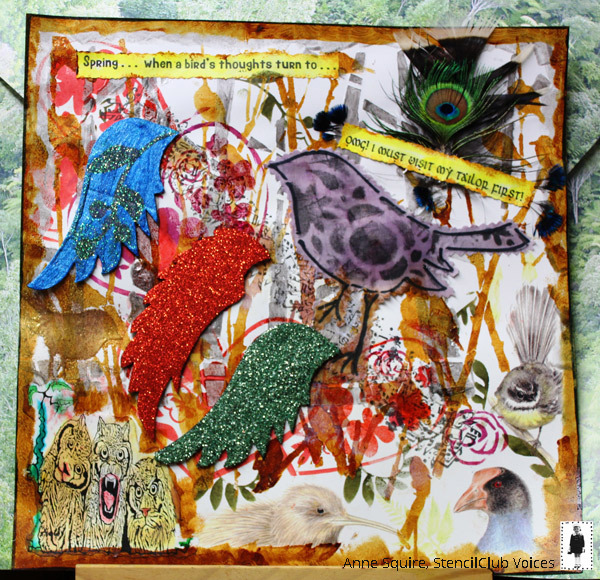 StencilClub Voices Make the Birds Sing! 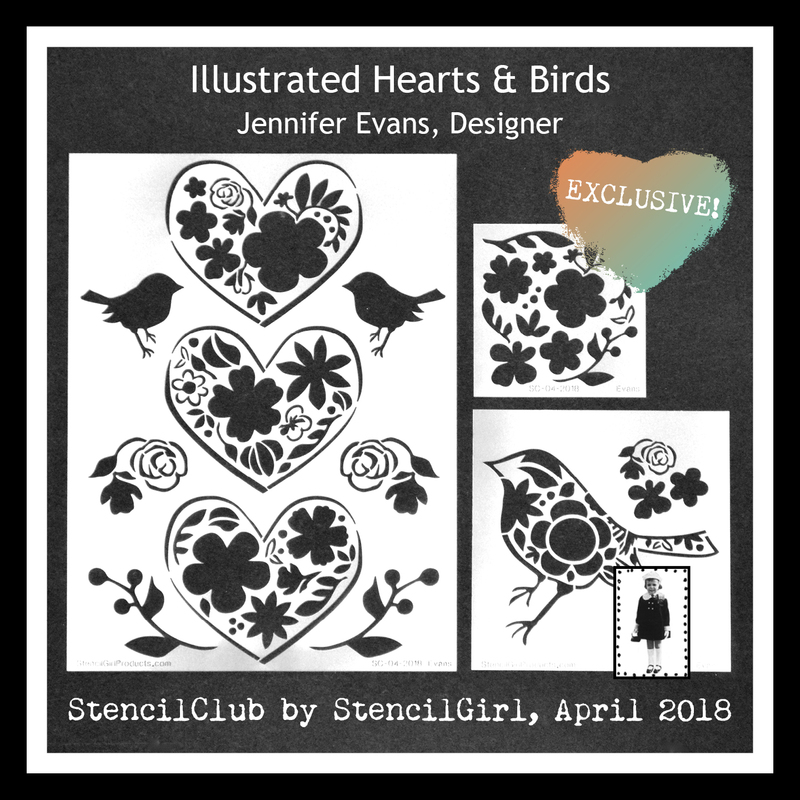 Just look what our StencilClub Voices, Shannon Hall, Tammy Michelle Lee, and Anne Squire created with this month's StencilClub set! I wanted to create a tribute to the blue birds outside my backdoor window. They found a way to trick the mockingbird so they can eat out of the bird feeder. They work in teams: one eats while one stands guard to distract the mockingbird. Then they switch. It’s so cool to see how they work together! Obviously the April stencils were perfect!! 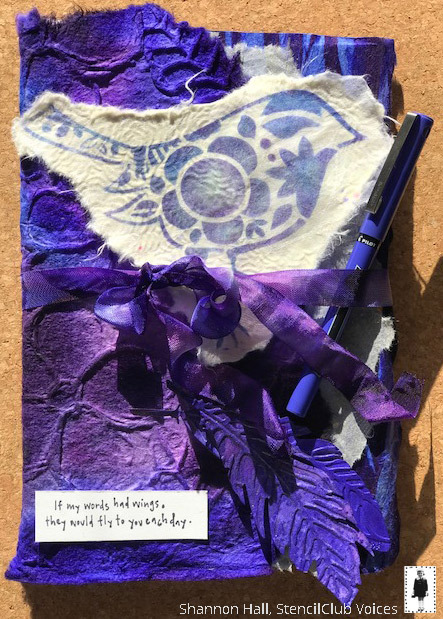 Shannon writes: The journal is covered using (purchased) handmade paper that I dyed with spray inks. I used Pan Pastels to create the bird on mulberry paper. I then dyed ribbon to match using spray ink. 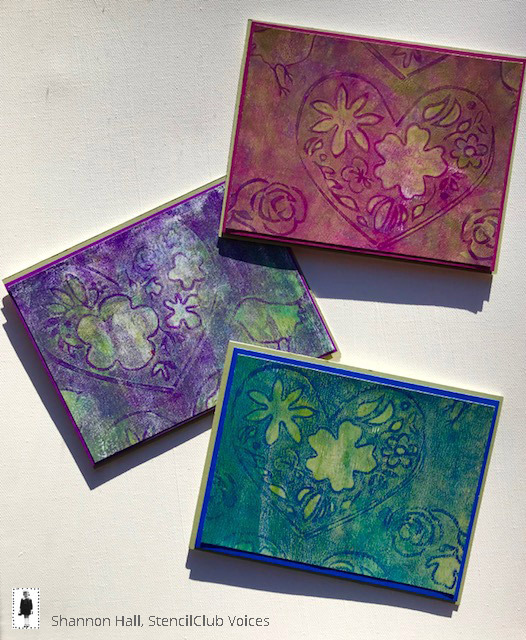 I made the cards using my Gelli Plate & acrylic inks. I like to keep cards on hand & add sentiments later or bundle sets as gifts for friends. 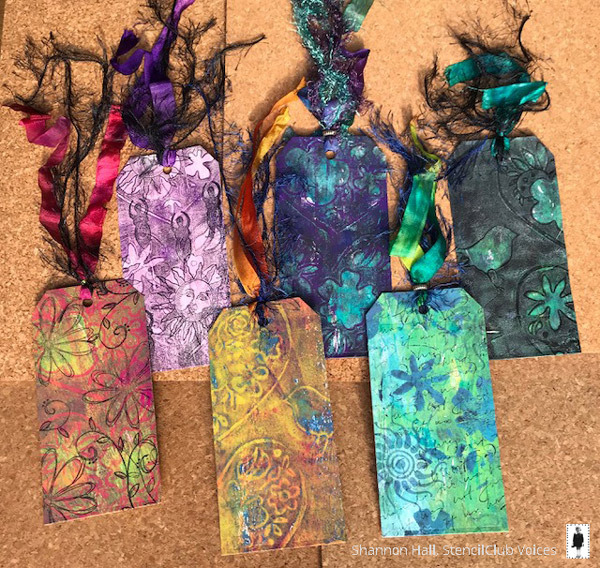 The tags were also made using my Gelli plate. I added a bit of stamp detail to some. I dyed the ribbon to match using spray inks. Anne writes, "Having scored literally reams of Kiwiana scrapbooking papers, they've got to be used up." "It is Spring, and a rather bedraggled bird - stenciled onto a ripped up & dyed Egyptian Cotton sheet (tmi?) - suddenly realizes he needs to refurbish his wardrobe in order to attract a mate." There's quite a selection of wings hanging off Carabelle's quelques notes de music wardrobe bar, the blue one heat-embossed a portion of the stencils. Before working the new stencils, the first layer was bare tree trunks of September 2017 Club, using Lindy's Gang Steel Shimmer Magicals mixed with pouring medium. The second layer was Black birds in trees stencil. 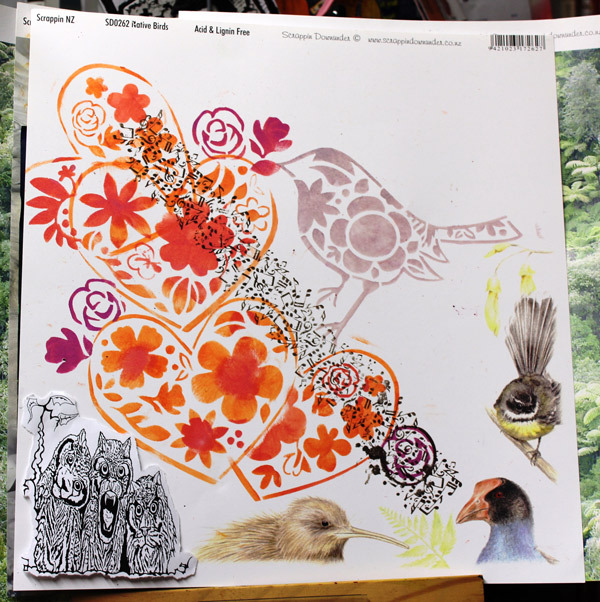 After that the hearts and flowers of this month's stencil release were superimposed, one of the birds also heat-embossed. Those are real feathers sprouting from the tailor text. The Bizarre Beasties (I think these are by LeighSB Designs) are probably thinking back to the tale of Little Black Sambo, "Now who's the smartest tiger birdie in the jungle?" You can see more HERE. Wow! 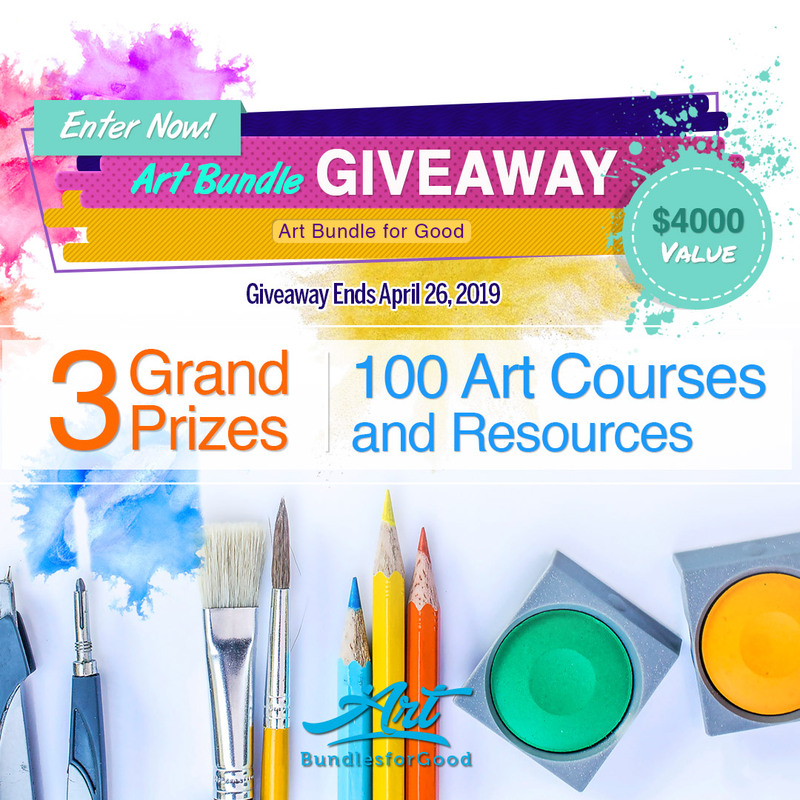 All of us at StencilGirl hope you are inspired to go create your own art and share it! Need these stencils? You need to be a member of StencilClub. Don't worry, you can make that happen when you SIGN UP. I love seeing this post and I am so excited for this months stencils. 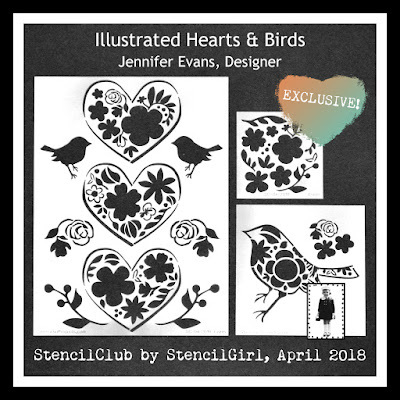 I had just been thinking to myself that I have no stencils with birds and then this months preview came out! What a blessing and such a surprise.Can't wait to create. Thank you for always posting such beautiful inspiration.